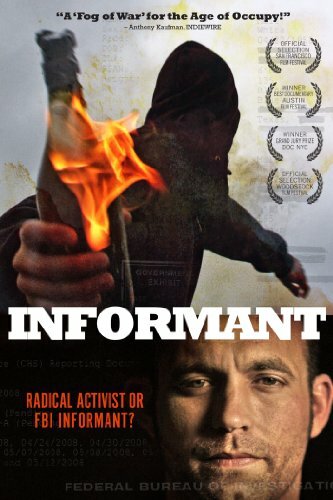 Chicago, IL (October 14, 2013) - Informant presents a powerful and timely portrait of Brandon Darby, a left-wing activist turned FBI informant and then Tea Party conservative whose actions led to the arrest of two protesters at the 2008 Republican National Convention. In chronicling the story--and mystery--of Brandon Darby, Informant , written and directed by Jamie Meltzer, offers an unsettling look at the hidden use of informants in contemporary America - an especially contemporary issue in light of the recent leaks about government surveillance. Winner of the Grand Jury Prize at the 2012 DOC NYC Festival, and Best Documentary at the 2012 Austin Film Festival, 2012 Sebastopol Documentary Film Festival, and 2012 Fargo Film Festival, Informant will be released on DVD for the first time ever on November 19, 2013 (prebook October 15, 2013) by Music Box Films Home Entertainment. The Informant DVD will include a host of bonus features and carry the suggested retail price of $29.95. In 2005, Texas-born Brandon Darby became an overnight hero when he traveled to Katrina-devastated New Orleans and braved toxic floodwaters to rescue a friend stranded in the Ninth Ward. Soon after, he became a co-founder and spokesperson for Common Ground, a successful grassroots relief organization. But over the next few years, he began hiding a shocking secret. After two young protestors, David McKay and Bradley Crowder, were arrested at the 2008 Republican National Convention, Darby revealed he had been instrumental in the indictment as an FBI informant. Today, having renounced his Left-wing past, Darby is a Tea Party darling who writes regularly for the right-leaning website Breitbart.com. Informant is the only film to have direct access to Darby, who has been alternately vilified and deified over the past five years. A documentary that is as compelling as it is disturbing, Informant constructs a picture of Darby's life through interviews and reenactments (starring Darby himself! ), wherein friends and commentators often contradict Darby's version of past events. In the process, the film examines the nature of trust and reality in our media-saturated world, while acknowledging the erosion of civil liberties and the escalation of government spying in the U.S.
One part portrait of how a radical activist became an FBI informant and Tea Party conservative, and one part cautionary tale about the dangerous possibilities created when activism, power and public trust converge, Informant is a riveting contemporary documentary. Music Box Films is a leading theatrical and home entertainment distributor of international, American independent and documentary films in North America. Past releases include Guillaume Canet's hit thriller TELL NO ONE; the film adaptations of Stieg Larsson's trilogy of international mega-selling novels - the first in the series- THE GIRL WITH THE DRAGON TATTOO, with over $10 million in US box office, was one of the most popular international releases of the decade; Terence Davies' THE DEEP BLUE SEA starring Rachel Weisz, New York Film Critics Circle Best Actress winner; and Philippe Falardeau's Academy Award-nominated MONSIEUR LAZHAR. Upcoming titles include Roger Michell's LE WEEK-END, written by Hanif Kureishi and starring Jim Broadbent; the hit French mini-series THE RETURNED premiering on Sundance Channel; five-time Academy Award(R) nominee Jan Troell's THE LAST SENTENCE; and Jan Ole Gerster's German smash hit OH BOY, which swept the German Oscars earlier this year. - Featurette of Brandon Darby at an Occupy Wall Street rally.